Golden trout, the state fish of California, are often considered one of the most beautiful trout in the world. Their small native range and remote habitats also draw anglers from around the country to chase these elusive fish. What the golden trout often lacks in size, it makes up for in coloration, isolation, and mystery, having a much smaller range than most other species out there. 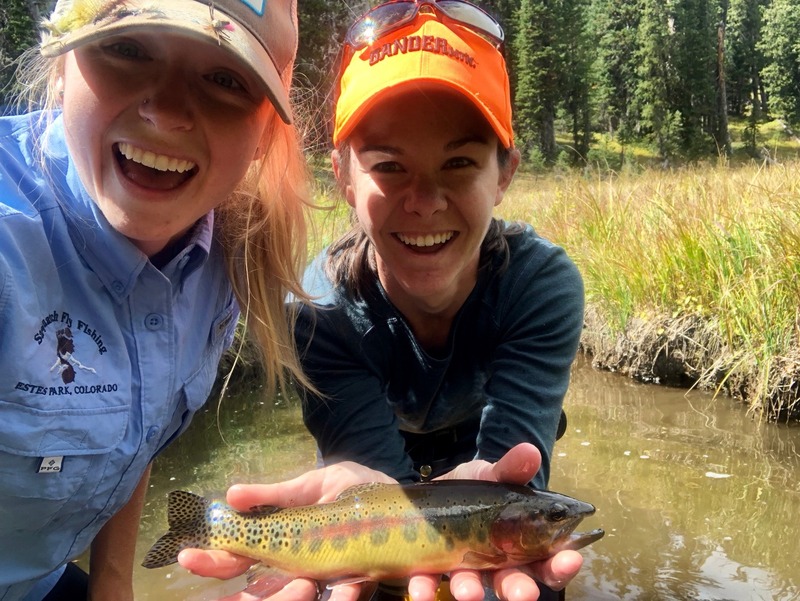 Recently, somewhat of a cult following has developed, with people keeping track of each place they’ve caught a golden trout, or chasing them in other states or remote places. When was the last time someone made a note of every rainbow they’ve caught? Golden trout are prized both for their beauty and their elusiveness. Of all the golden trout’s unique qualities, its appearance is probably the most well-known. They are usually very brightly-colored, although depending on their habitat can range from striking to more drab. Goldens have bright yellow-gold sides, fading into a darker back and dorsal fin, and a pronounced red band along the lateral line. The red band is usually more distinct than the pinkish bar on a rainbow. They have around 10 parr marks (dark oval markings) on each side, which are often seen on other species when they are young, but are visible even on adult goldens. Their lower fins resemble those of the brook trout: red-to-orange with white tips and leading edges. Their bellies also share this red or orange color. They usually have distinct spots on their dorsal and caudal fins, and caudal peduncle. Golden trout usually don’t grow large in their native habitat, generally maxing out around 10-12 inches. Those introduced to western lakes often have a different appearance. Most notably, they can grow much larger, up to 10 pounds or more. They also often lose some of their finer details like parr marks. The golden trout’s scientific identity has been somewhat debated over the years. 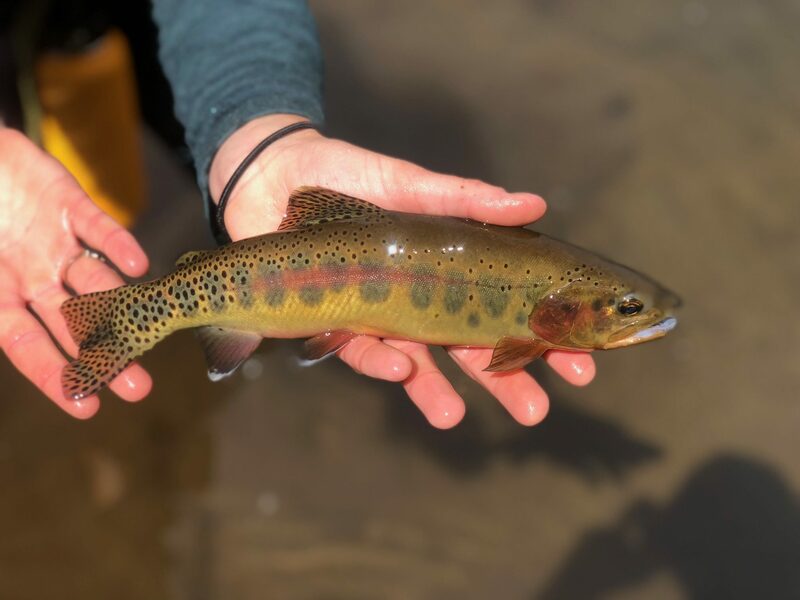 In a nutshell, the debate is whether the golden trout is its own species (Oncorhynchus aguabonita), or a subspecies of rainbow trout (O. mykiss aguabonita). It is a close relative of the Kern River rainbow trout (O. m. gilberti) and the Little Kern golden trout (O. m. whitei), both subspecies of the rainbow. What is normally referred to simply as the golden trout, is more specifically called the California golden trout. Originally, golden trout were thought to belong to the Salmo genus, with other species like Atlantic salmon and brown trout. It wasn’t until later that scientists concluded they were actually more closely-related to coastal rainbow trout, and began grouping these subspecies under rainbows. Today, you’ll still see reference to both the golden as a unique species and the golden as a subspecies of the rainbow, but rarely as a member of the Salmo genus. The California golden trout originated in the cold, clear streams of alpine California. Though they are now in other states as well, they still tend to prefer this habitat. That being said, they can also be found in alpine lakes, and often grow larger here. In general, golden trout run smaller than many other trout species. This is usually attributed to the fact that their native alpine streams aren’t very productive. Within streams, they often prefer pools and deep, undercut banks. Golden trout are sexually mature after about 3-4 years. They spawn in June and July, when water temperatures reach around 50° F or higher. In streams, goldens spawn in gravel riffles, and lake populations will also move into streams to spawn. Embryos hatch from eggs after 20 days, and then emerge from their gravel nests after an additional few weeks. Goldens feed throughout the day on whatever is abundant, both on the surface and below. Their tendency to actively feed during the middle of the day hints at the fact that they don’t have many natural predators, something that also allows them to sport bright colors. They do, however, have a hard time living with other fish species since they are easily preyed upon or out-competed. The golden trout’s native range is tiny. 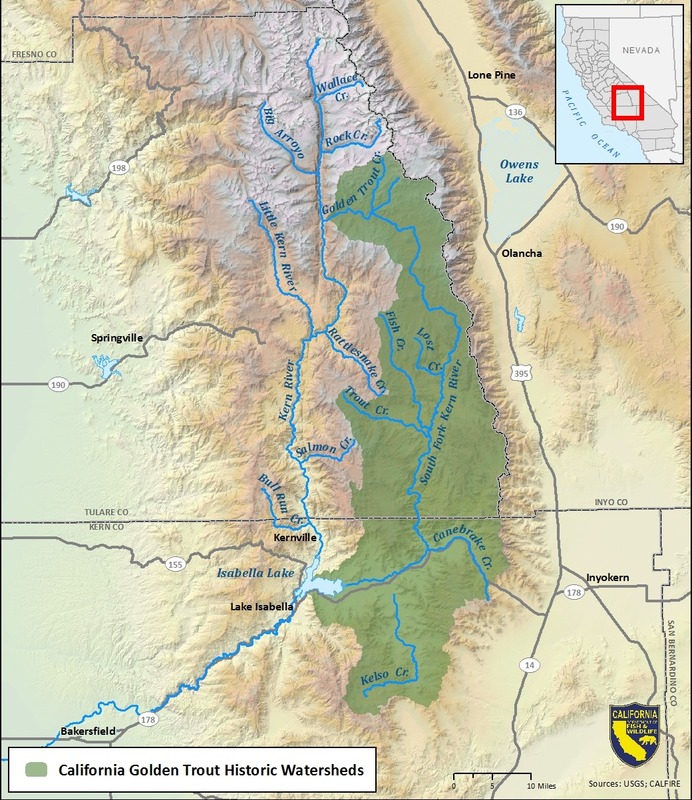 They were originally found only in two streams within the Kern River system: Golden Trout Creek (and Volcano Creek tributary) and the South Fork of the Kern River. Since then, goldens have been introduced around the west in both lakes and streams. 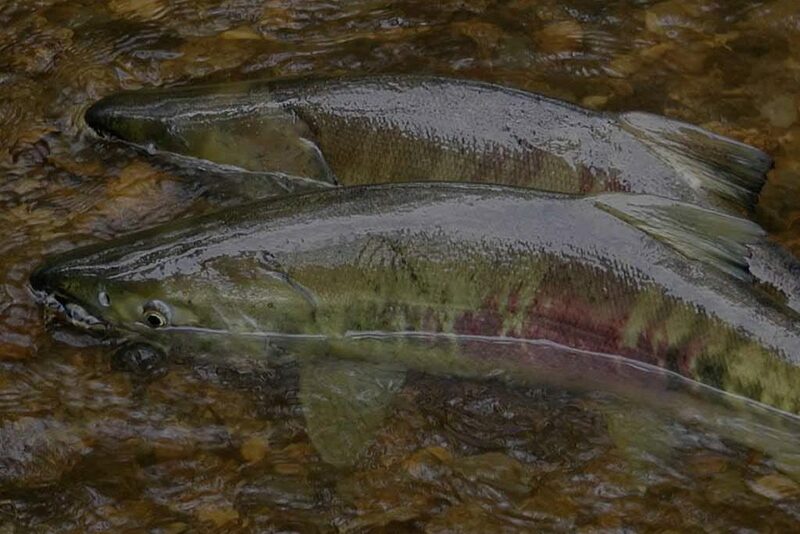 Many of these populations didn’t make it, or hybridized with cutthroats or rainbows. Even in their native range, many have hybridized outside their species, and true golden strains aren’t very common. Though they’ve been stocked around the west, probably the most well-known and thriving transplanted populations live in Wyoming. Wyoming also holds the record for the largest golden trout, at over 11 pounds. In addition to Wyoming, records indicate populations have existed in Arizona, California, Idaho, Montana, New Mexico, Nevada, Oregon, Utah, Washington, Wyoming, and Colorado. In 1892, David Starr Jordan, President of Stanford University, first described the fish that would later be named the golden trout. At the time, he said “This trout is evidently an off-shoot or descendant of the widely distributed Cut-Throat Trout, Salmo mykiss, which is found in all the rivers suitable for trout between the Sierra Nevada and the Rocky Mountains.” He also mentioned that the name “aguabonita” was named for Agua Bonita Falls, a waterfall in Volcano Creek where the first specimens were collected. According to him, the first specimens were collected in 1875, and were first documented in 1878 in the Annual Report of the Chief of Engineers. In the early 1900s, golden trout were transplanted to other areas. Initially, they were packed north in California. By 1917, golden trout eggs from the Cottonwood Lakes were being used to stock waters in both California and other states. 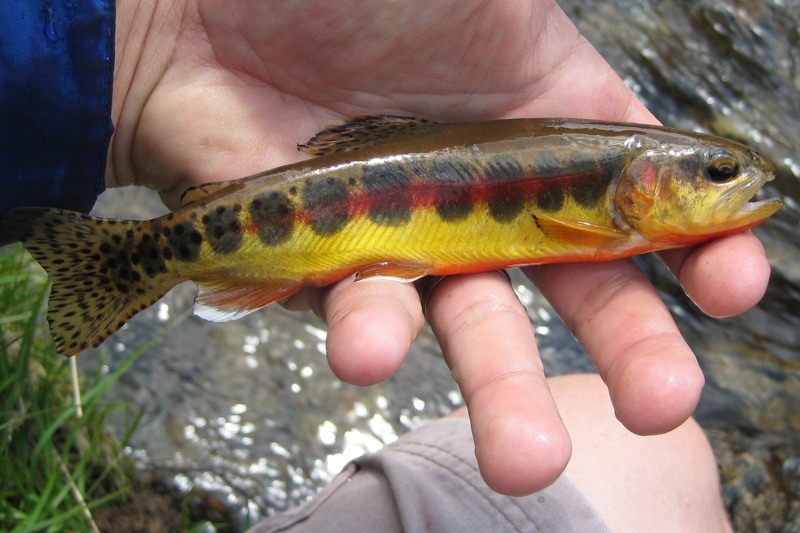 Although abundant at the time of discovery, golden trout have had a rough time since then. Starting in the 19th century and continuing into the 20th, populations rapidly declined. They’ve faced a variety of threats over the years, including overfishing, heavy grazing, hybridization with rainbows, and predation by browns. In addition to the hybridization and predation, other species of fish pose a threat to goldens through competition, since both rainbows and browns can easily outcompete the small golden trout. There have been efforts to help the population of golden trout. In 1978, the government set aside the Golden Trout Wilderness to protect the species (Wilderness areas are some of the most pristine tracts of land in the country, since they are more restrictive of human activities than other areas). From the 1960s-2000s, many nonnative and hybridized trout were killed off with piscicides and gill nets. Grazing has also been limited in sensitive areas to keep cows from entering golden trout waters. In 2004, the California Department of Fish and Game created the Conservation Assessment and Strategy for the California Golden Trout (Oncorhynchus mykiss aguabonita), which listed threats to goldens and plans to conserve their populations. Despite these efforts, goldens are still at risk. 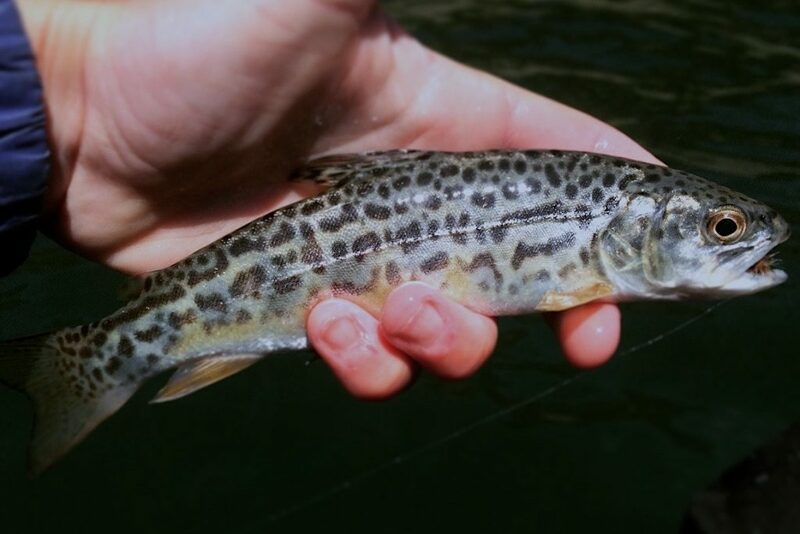 Consider joining or supporting organizations like CalTrout and Trout Unlimited to help these rare and beautiful fish. 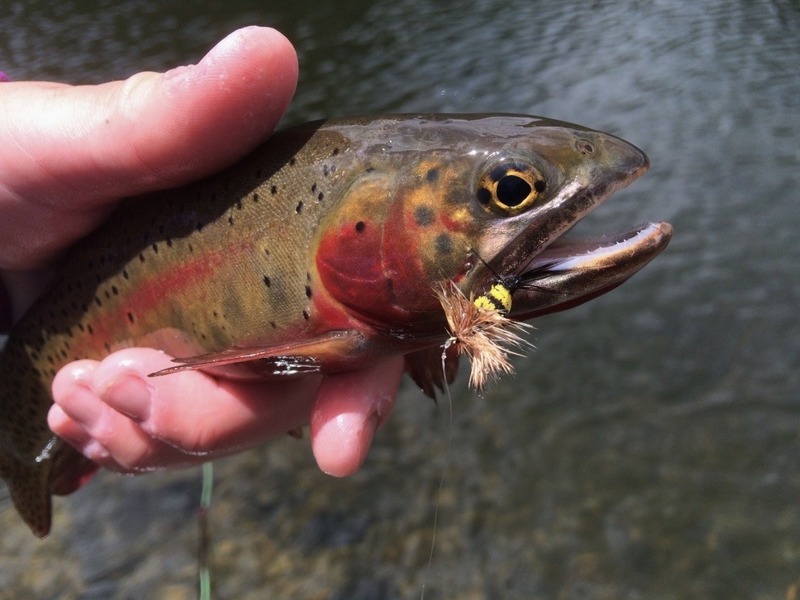 Next PostWhat is a Triploid Trout?